A. IPv6 clients connected to port1 can use SLAAC to generate their IPv6 addresses. B. FortiGate can provide DNS settings to IPv6 clients. 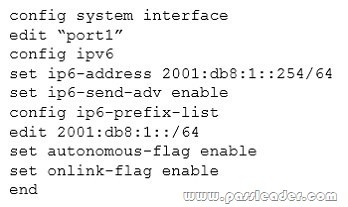 D. FortiGate can provide IPv6 addresses to DHCPv6 client. You wish to create a firewall policy that applies only to traffic intended for your web server. The server has an IP address of 192.168.2.2 and belongs to a class C subnet.When defining the firewall address for use in this policy, which one of the following addressing formats is correct?